Superstar Shake-up means a lot of new changes. Change might not always be good but sometimes, it is the most important thing, as it allows new beginnings that might be the best for business. When it was announced that the Usos had been drafted to RAW, the fans went berserk as they are perhaps the biggest Tag Team in the company alongside New Day. However, that wasn’t where it stopped as the best pick of the day was saved for the last. The main event of RAW was between the team of Drew McIntyre, Baron Corbin and Bobby Lashley and the team of Roman Reigns, Seth Rollins and an unknown third member. And when the time came, the mystery third member of the babyface team was none other than AJ Styles. 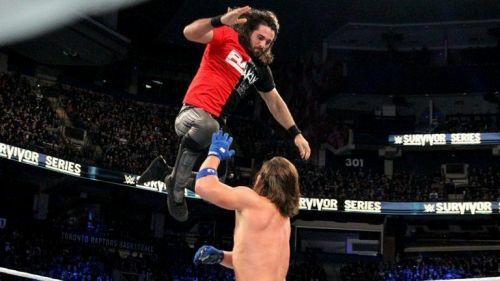 SmackDown Live might be the house that AJ Styles built but RAW is his new home now and everything points toward a feud between AJ Styles and Seth Rollins for the WWE Universal Championship. The next officially confirmed PPV for WWE is the Money In The Bank. It is one of the most exhilarating events in WWE as multiple Superstars tear each other apart to go on top of the ladder and grab the briefcase. This year is going to be no different and the first step to set up a feud between Rollins and Styles would be to make the latter win the Money In The Bank. It makes sense because not only have many top Superstars won the event and made history in the process, but also that both Styles and Rollins are faces now, and the Styles going up to Rollins and challenging him for the Universal Title without context would make little sense.